In the ‘Venice of the North’, bridges over the many 17th century canals are plentiful, but nearly all of them are for vehicles and bicyclists. 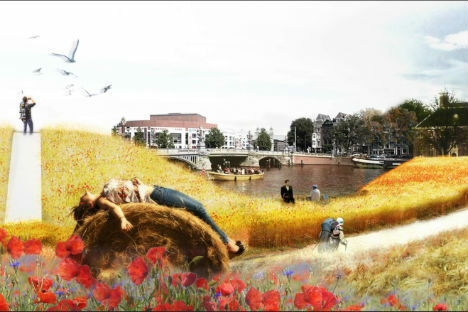 The Iconic Pedestrian Bridge competition by AC-CA sought design concepts for a bridge that would go beyond a simple structure spanning the Amstel River in Amsterdam, adding additional functionality. 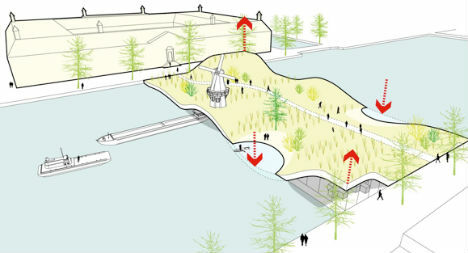 Though it was not chosen as a winner, this proposal by Aïe Architectes certainly stands out: a grass-covered bridge that functions as a public park and water filtration system. The bridge itself is an undulating structure mimicking waves on the surface of the water, with raised areas for ships to pass beneath as well as planes that meet the surface of the river for water-based activities. Covered in grass, the bridge functions as a public park with a central pedestrian and bike path running through it. 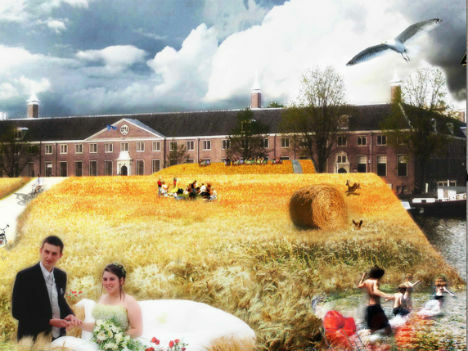 The Amstel River-Yard Project is adaptable, able to become space for urban farming or forests if necessary, and offering a picturesque venue for events. At one end is a bicycle repair station and at the other is a sloping building with cafe, office, bathroom and shower facilities. Its roof provides a gentle incline for sledding in the winter. The grass on top filters rainwater before it runs into the canal.